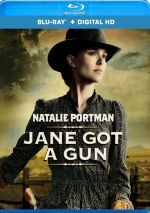 Is it possible the filmmakers behind 2016’s Jane Got a Gun didn’t realize the title strongly echoed a hit Aerosmith song? Probably not, but that’s where the similarities end, as the movie gives us a Western. Set in the New Mexico territory circa 1871, we meet Jane Hammond (Natalie Portman) as well as her husband Bill (Noah Emmerich) and young daughter Kate (Mia Wagenman). They seem to lead a pleasant prairie life until Bill’s past comes back to haunt them. Bill finds himself tormented by the Bishop Boys gang and their leader, John Bishop (Ewan McGregor). In need of help, Jane recruits her former lover Dan Frost (Joel Edgerton) to fend off their foes. With its female protagonist, one might expect Gun to provide a “girl power” variation on the usual Western themes. One will not find that, however, as the film tends to offer a more somber, character-driven affair. Which is fine – I won’t criticize Gun because it doesn’t provide what I expected. Instead, I’ll take it on its own merits – and criticize it because it seems so thin and forgettable. Gun comes with the bones of a good Western. It involves complicated relationships as well as tragedy and a desire for revenge. Add to that the unusual nature of the aforementioned female protagonist and the movie shows promise. While not a dud, though, Gun just never really gets going. Even though it focuses on its characters above all else, it develops them less well than I’d like and leaves them somewhat anonymous. Even the titular Jane feels thinly drawn, and none of the others show much dimensionality either. Gun clearly wants to go in the opposite direction of the wild Tarantino-esque affair I expected, and I think it goes too far, as the end product tends to lack energy or heft. Rather than involve us in its characters and situations, the movie gives us little more than a mopey love triangle. Endless flashbacks don’t help. While I understand these offer important information, I think the filmmakers could’ve integrated them in a more artful and less intrusive manner. The film hops around chronologically in a manner that doesn’t seem jarring but it still doesn’t work. I do like the film’s cast, and they manage to eke out a little personality from their underwritten roles. McGregor does best of the bunch, as he adds life to his stock villain, but all the performers satisfy. Amusingly, Gun acts as a semi-reunion for the Star Wars prequels. Of course, Portman and McGregor played major parts in all three movies, and Edgerton took on the small role of Owen Lars. Like the Aerosmith connection, I must assume that those involved realized they’d created this “reunion”, right? Odd trivia aside, Gun offers a fairly inconsistent piece. The Western has a few strengths but lacks the narrative heft to make it succeed. Jane Got a Gun appears in an aspect ratio of approximately 2.40:1 on this Blu-ray Disc. The film boasted an excellent transfer. At all times, sharpness worked well. Virtually no softness crept into the image, so it remained tight and concise. Jaggies and moiré effects were absent, and I saw no edge haloes. Print defects also failed to appear. In terms of palette, Gun opted for a heavily yellow-sepia feel. Almost no other hues ever popped up, and that was fine, as the tint suited the Western story. Blacks came across as deep and rich, while shadows looked smooth and clear. This became a terrific presentation. Though not as good, the film’s DTS-HD MA 5.1 soundtrack satisfied. Much of the movie opted for a low-key presentation, with occasional bursts of action. Scenes with gunfire added some pep, but most of the movie focused on ambience. The soundscape didn’t dazzle but it fleshed out the settings. Audio quality worked fine. Speech was distinctive and crisp, and the musical score boasted nice range. Effects seemed accurate and full. This wasn’t a slam-bang mix, but it worked fine for the story. The disc opens with ads for The Hateful Eight and Macbeth. No other extras appear here. Despite a fine cast, Jane Got a Gun falters. The Western boasts a mix of potential strengths but it doesn’t explore its characters or narrative in a particularly engaging manner. The Blu-ray provides excellent visuals and positive audio but lacks supplements. Chalk this up as a mediocre Western.